Twenty-four states currently have “Choose Life” license plate options, and the anti-choice movement is working hard to increase that number. The very first of those plates was signed into law by Jeb Bush in Florida in 1999. Since then, “Choose Life” plates have raised $13.5+ million, much of which has been used to fund “Crisis Pregnancy Centers” (CPCs) that offer dangerously misleading (and often simply false) information about reproductive health. For more information on “Choose Life” plates, please see: http://www.choose-life.org/. For more information on CPCs, please see: http://www.prochoice.org/about_abortion/facts/cpc.html. In Massachusetts, a “Choose Life” plate has been available since summer 2010, but there is not currently a Pro-Choice equivalent. Pro-Choice Plates (PCP) is an effort to make sure such an option will soon be available. 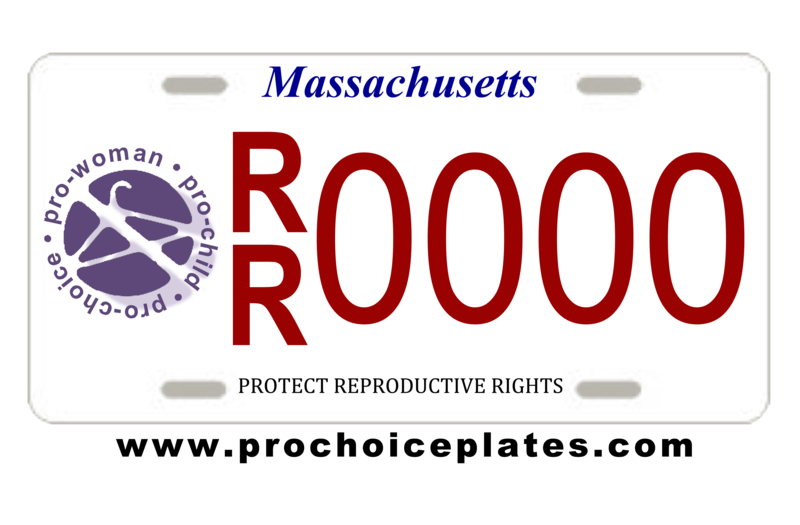 100% of the proceeds from the sale of the plate will be donated to organizations within Massachusetts that make comprehensive, medically-accurate reproductive health information and services (including abortion) more widely available, especially to those whose options might otherwise be restricted by lack of information or by inability to pay. This allocation of funds will help make abortion as financially feasible as childbirth, thereby making true reproductive “choice” more of a reality; it will help fill funding gaps that continue to marginalize women’s healthcare generally and indigent women’s healthcare specifically. PCP’s central objective is in the spirit of “choice” affirmed by the majority opinion in Moe v. Secretary of Admin. and Finance (S. Jud. Ct. Mass 1981): “Once [the State] chooses to enter the constitutionally protected area of choice, it must do so with genuine indifference. It may not weigh the options open to the pregnant woman by its allocation of public funds; in this area, government is not free to ‘achieve with carrots what [it] is forbidden to achieve with sticks’” (at 400-02). In addition to financially supporting organizations that make reproductive health resources more equally accessible, PCP will also otherwise seek to increase public awareness regarding the importance of reproductive rights; after all, every pregnancy-capable person should have the knowledge and tools to make an informed decision about contraceptive, pregnancy, and post-pregnancy options. To that end and through the combination of efforts outlined above, PCP will affirm reproductive justice and equality, while partially and constructively countering the deleterious effects of medical misinformation that “Crisis Pregnancy Centers” disseminate—misinformation that is supported by “Choose Life” license plate proceeds and that is often contrary to constitutionally-upheld notions of reproductive choice and informed consent. In order for PCP to get a proposal for our special plate approved, we must provide the Massachusetts Department of Transportation with 3,000 signatures—and pre-paid orders—for the new plate. The initial fee for each plate is $40, $12 of which goes to the DOT while the remaining $28 goes to Pro-Choice organizations. (There is also a one-time $20 plate “swap fee” payable to the DOT, bringing the grand total to $60. For complete details, see:http://www.mass.gov/rmv/express/plates.htm.) The plate can then be renewed every two years when one renews one’s car registration. At that point, 100% of the $40 special plate renewal fee will be passed on to reproductive rights organizations. If you would like to support this effort in any way (fundraising, publicity, purchasing a plate, ideas regarding organizations to partner with, anything and everything else), or if you just want to be kept up to date regarding our progress, please subscribe to the blog or send an email to prochoiceplates@gmail.com. Thank you!